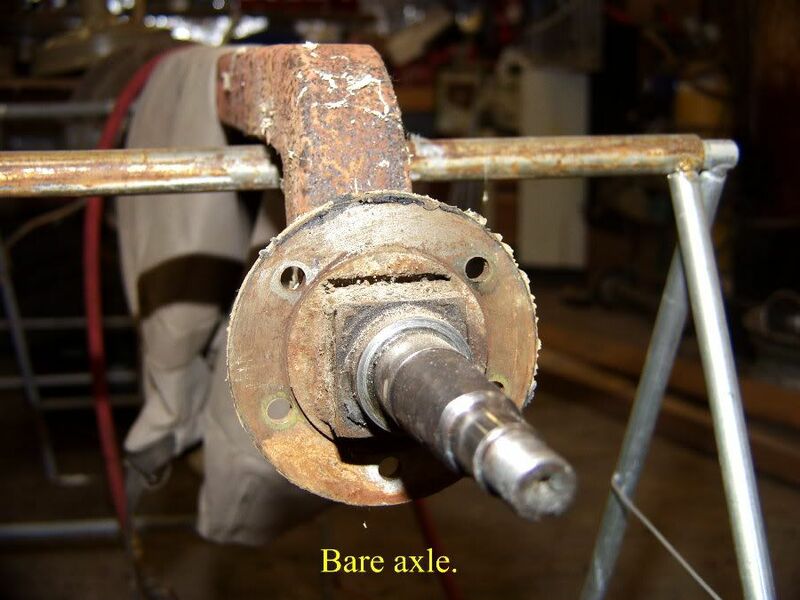 As the title suggests, this blog is about reparing a trailer axle. However, it is not just any old trailer axle, this one is magical!! No, just joking, but it is special, at least to me. 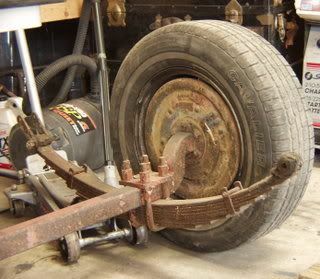 I ended up with this axle (and the rest of the trailer) a couple years ago when I was rehabbing a 1948 Mobile Sportsman trailer. The axle was left over from the trailer I bought to use for spare parts. While it sure doesn't look like much, the effort required to get the owner to turn loose of it was enough to loose sleep over. I bought, and paid for it, then waited as patiently as I could for 7 months for the owner to remove all his stuff. 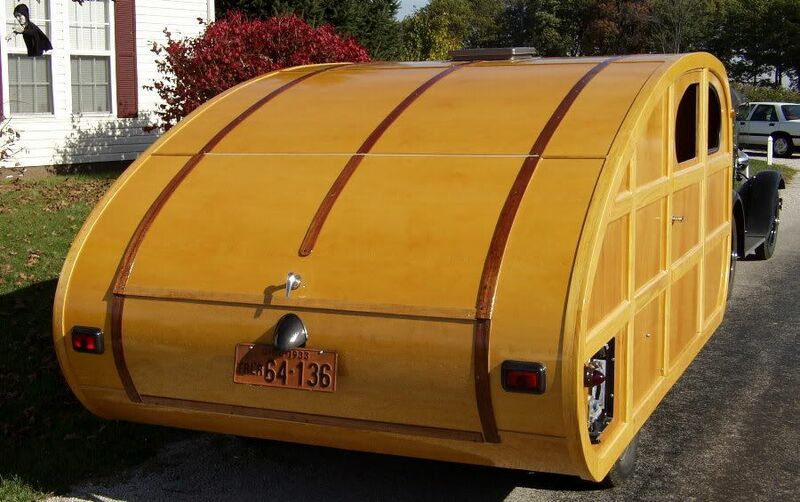 He had used it as a backyard shed for years, and while he was a pretty nice fellow, he didn't get in a hurry over anything! Well, believe you me, when I got ahold of it, no time was wasted! I removed all the parts I needed, and anything worth saving, down to the frame in one weekend. 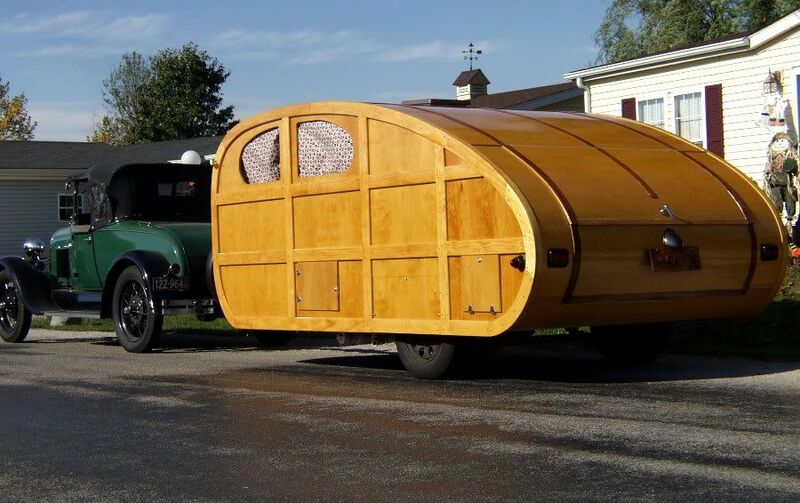 All the while, I had in mind to use the old frame and axle for another trailer I wanted to build, a version of a "Cabin Car". 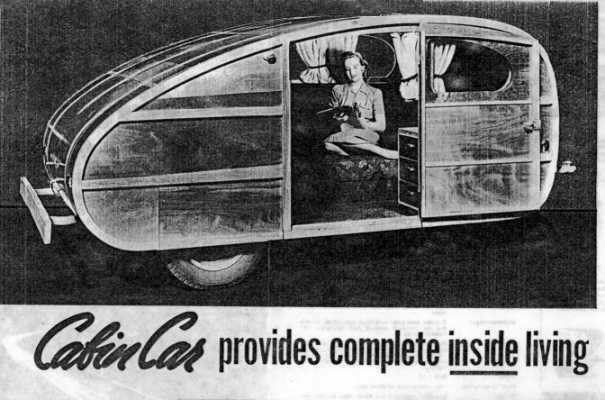 Click on the photo to see Cabin Car images others have generously shared with me. 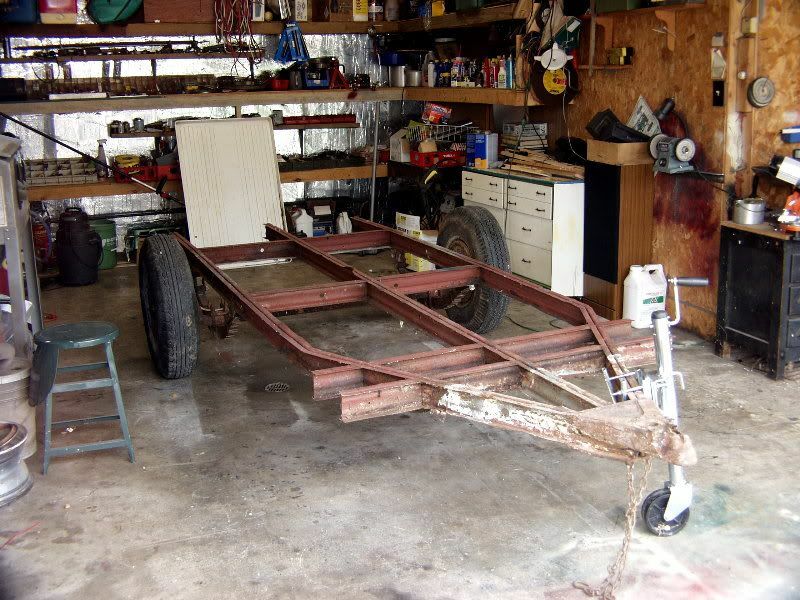 After stripping all the parts from the old trailer, I was left with the frame, and axle. After a fair amount of effort to derust and strengthen the frame, work began on the Cabin Car body. Well, here it is...pretty sad looking, huh? 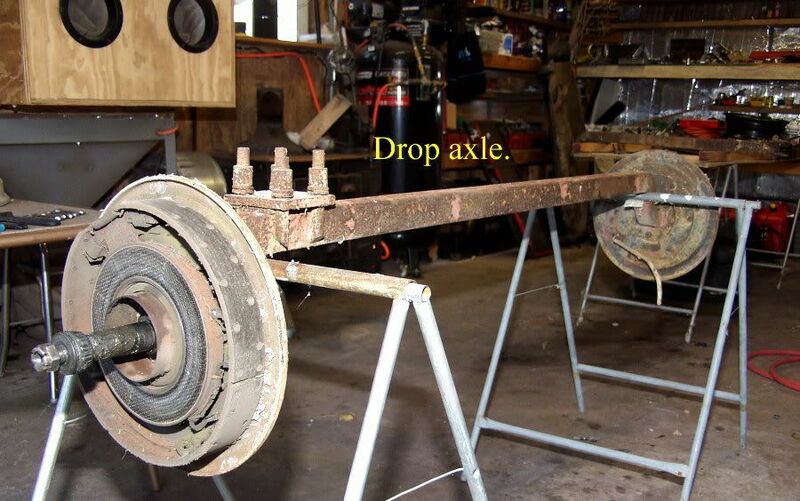 Yes, I could have just bought a new axle, and saved all the effort, but they really don't make them like this anymore, it is extermely heavy duty, and like new (with exception to the rust...) besides, I hate throwing things away. Most old trailer axles didn't get a lot of use, they were parked somewhere, and there they sat, for years and years. This was one of them, for being 55 years old, it has almost no wear. You're probably thinking I'm nuts by now...and I may be, but watch as I take this old axle apart, clean, inspect, paint, and reassemble. 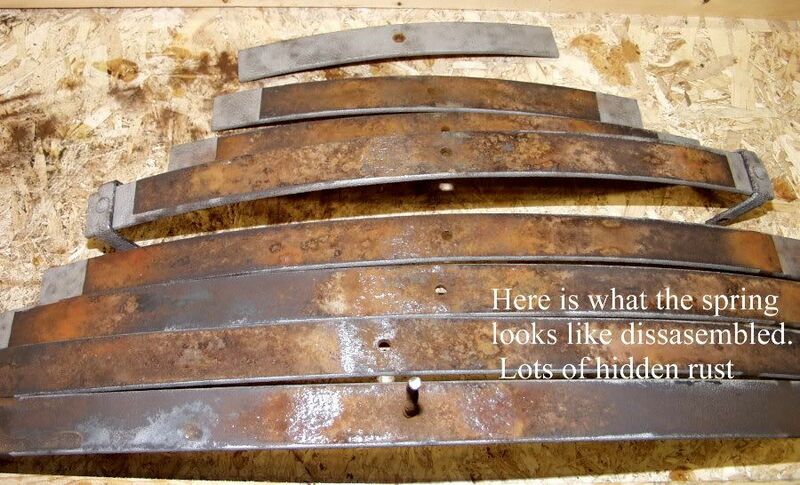 I'll start with the leaf springs. The springs are an often overlooked part of rehabbing an old trailer. Most people will clean the spring, maybe paint it, and call it done. Ever ridden in a luxury car? Pretty soft smooth ride isn't it? How about a heavy duty truck? Rather rough and bumpy isn't it? 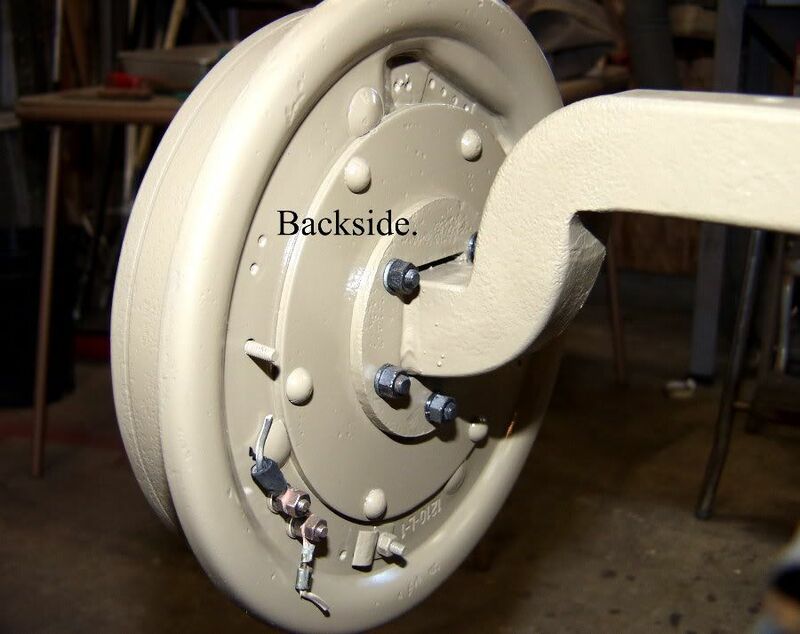 Trailer springs are designed/engineered to provide adequate support for the trailer without being too stiff. Too stiff makes for a bouncy hard ride. 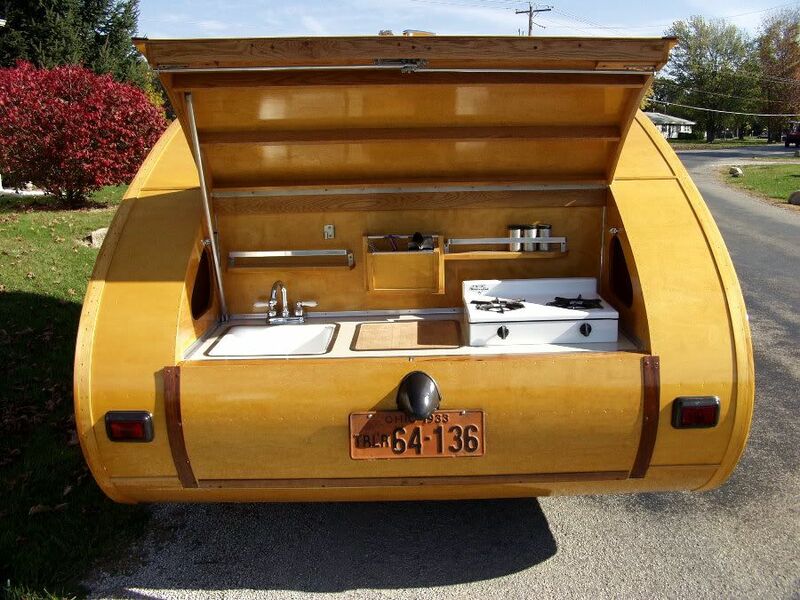 A bouncy hard ride makes things break in cabinets, is hard on the trailer body and frame, and contributes to poor handling. So where am I going with this? 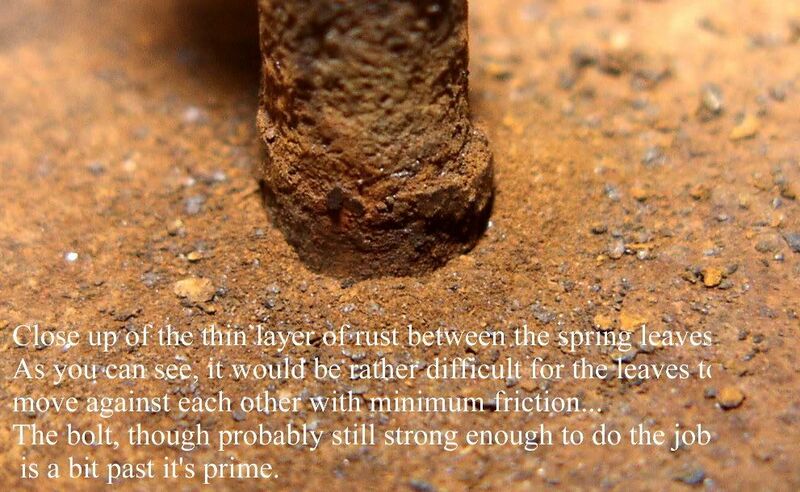 Well, over the years, dirt, dried grease, and rust are trapped/form between the spring leaves. The result is that a spring that used to flex as designed, now struggles against layers of rust and crud. Unable to move as designed, the once flexible spring is now quite rigid. Here is a closer look at what lies between the leaves. New grade 8 bolts were used to reassemble the springs. 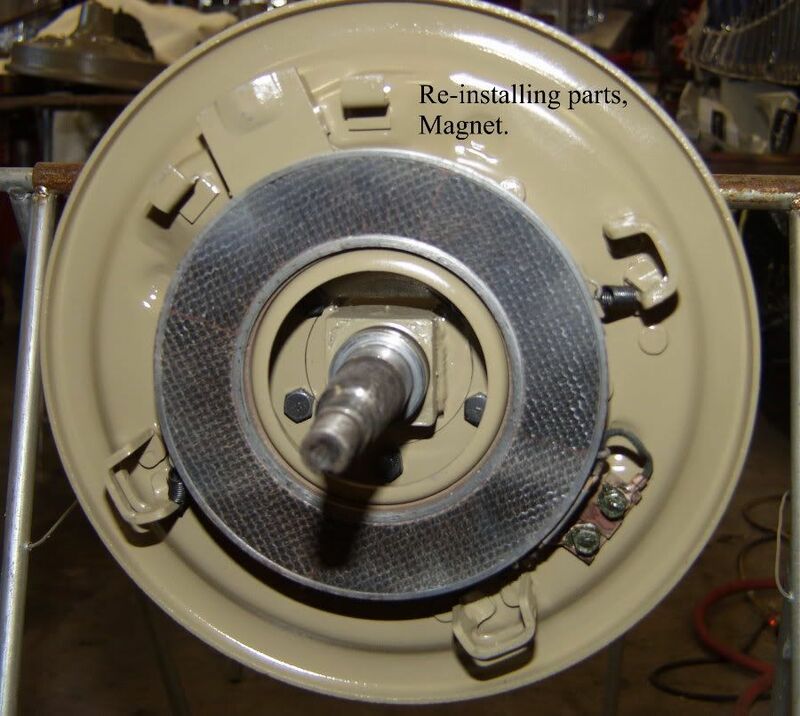 The main bolt that holds the leaves together has a round head, to fit into the centering hole in the axle, or plate. It is very easy to use a grinder to round the head of the grade 8 bolt to fit that hole. Many old springs, not only trailer, are very worn. Some have lost their ability to hold the weight, and must be re arched, or replaced. In some cases, the springs are still very usable, but have grooves worn where the end of a leaf has rubbed countless times against the adjacent leaf. 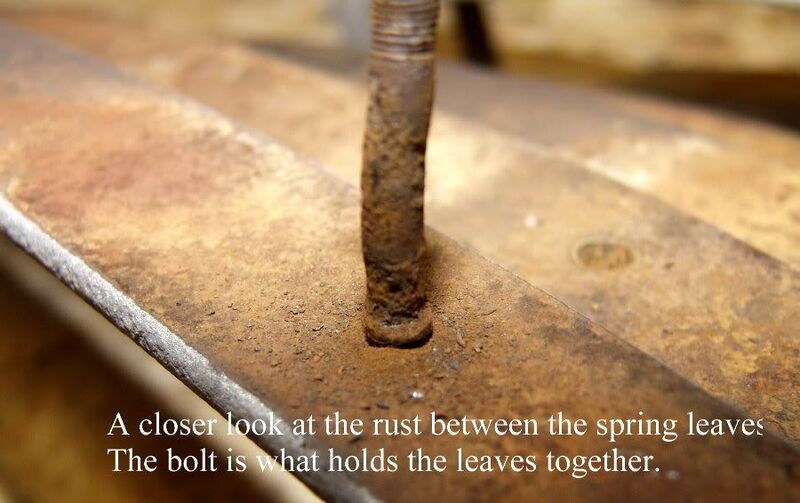 When this happens, the result is similar to having rust or debris between the leaves, the spring can't flex. 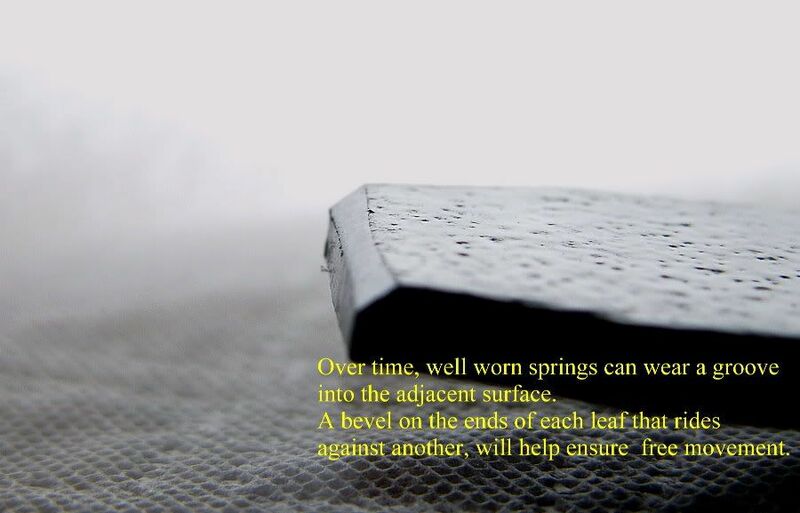 The cure is very simple, grind a bevel on the end of each spring leaf that slides against another. 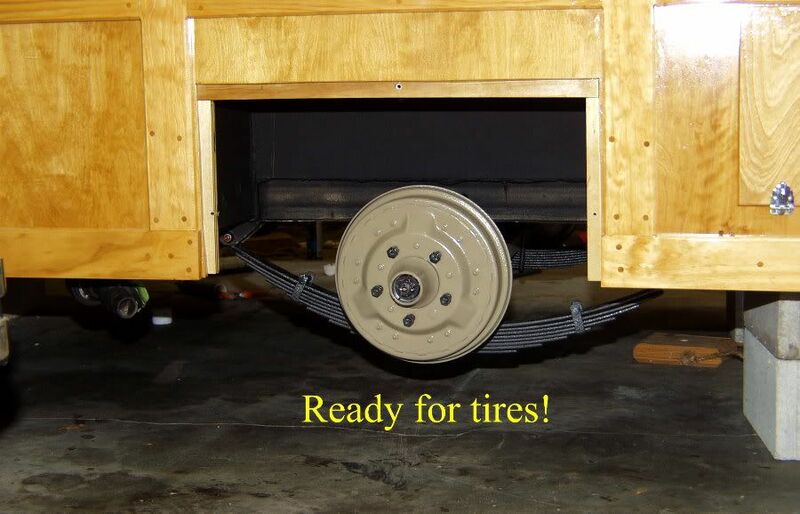 Even if your springs don't have any visible wear, it is still a good idea to do this. Whenever rebuilding an axle, ALWAYS replace the U bolts. While they may sometimes look okay, it just isn't worth the chance to re-use them. Any good automotive store can get you new U bolts. They may not have your size in stock, but since they are custom made anyway, it is no problem fitting the correct bolts to your axle. On mine the factory must have gotten a deal on some extra long U bolts...Or someone just couldn't measure very well? The bolts were so long, that extra washers had to be used on all, and a steel shim had to be inserted on one side to prevent bottoming the nut at the end of the threads before it was tight. No big deal I suppose, but they forgot to cut off the excess threads, which over time, damaged the trailer frame. On underslung axles, the U bolt heads point up toward the trailer, on overslung axles, the heads point down. Rubbing the pavement isn't such a good thing either...Cutting off the excess is the best option. Next step is to remove the hubs, to expose the braking system. However, in hindsight, I've chosen to at least describe the process for those who have never done so. First remove the dust cap in the center of the hub. You can use a large pair of channel lock pliers, or a screwdriver to pry it out. The dust cap is a friction fit part. Try to be careful, most old dust caps are an odd size, and can be hard to find. Next, use a wire cutter, or pliers to remove the cotter pin in the castle nut (found under the dust cap). Save it as a reference (for sizing new ones) but do NOT re use it! Cotter pins cost only a few cents each, and are the safety that keeps the wheel from departing your trailer at 65 mph if the nut comes off! For the next step, you'll want to have some old rags, or gloves. With one hand (or a helper) hold the hub to the backing plate, with the other hand, remove the axle nut. At this point, the hub may slide off the shaft and onto your foot...Be careful, the hub is very heavy! With the nut removed, carefully slide the hub forward a couple inches. There is a flat washer behind the nut, and then the outer wheel bearing that will slide off the axle shaft when you slide the hub forward. Both these parts are very greasy (slippery). Once out of the way, get a good hold on the hub, and remove. The inner wheel bearing is held in place by the grease seal, on the other end of the hub, once the seal is removed, the bearing will come out. The need for replacing bearings, races, and seals is something you'll have to determine when you have them in your hand. If you choose to re-use them, at least get them very clean (de-grease them) before packing with new grease. 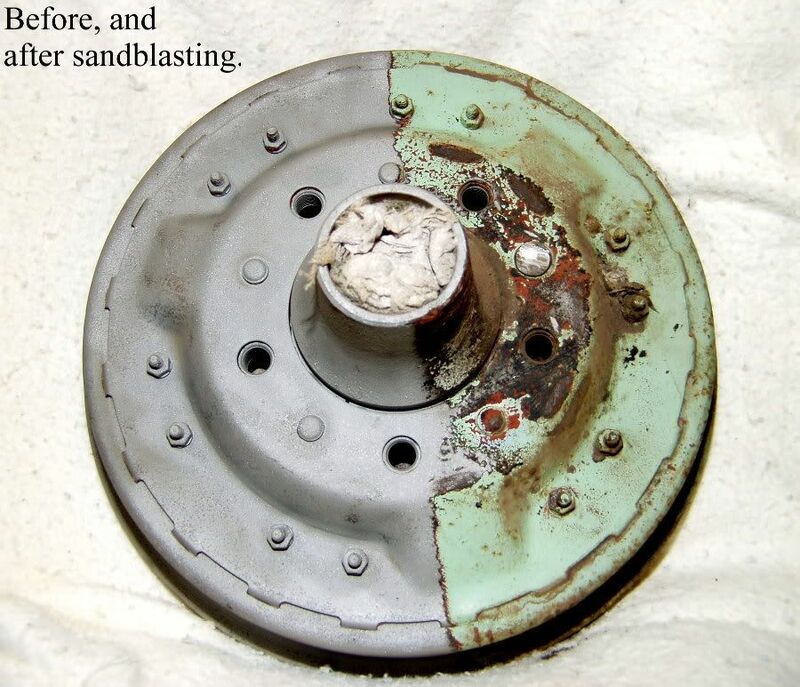 Before you can sandblast the hub, it must be de-greased. ANY grease/oil left inside will trap grit, etc. 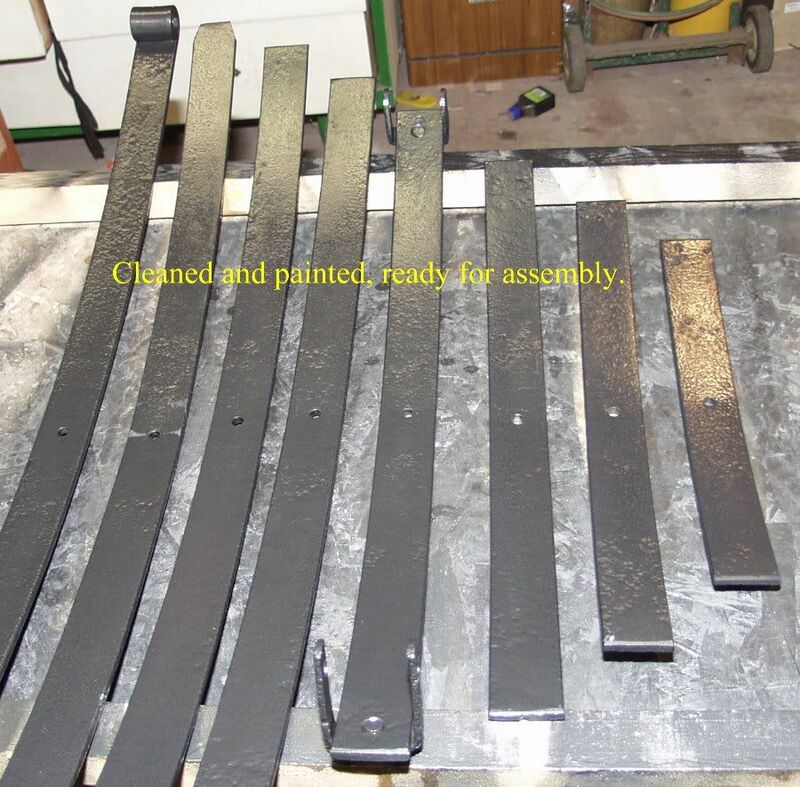 Where you don't want it, and any grease/oil knocked off by the sandblaster will, if using a recycling setup, be forced back into the metal at high pressure. Start by using towels to remove the bulk of the grease, then soak the hubs in a degreasing solution of your choice. I prefer mineral spirits, followed by a rinse of acetone, but whatever the method, just be sure you get it all. 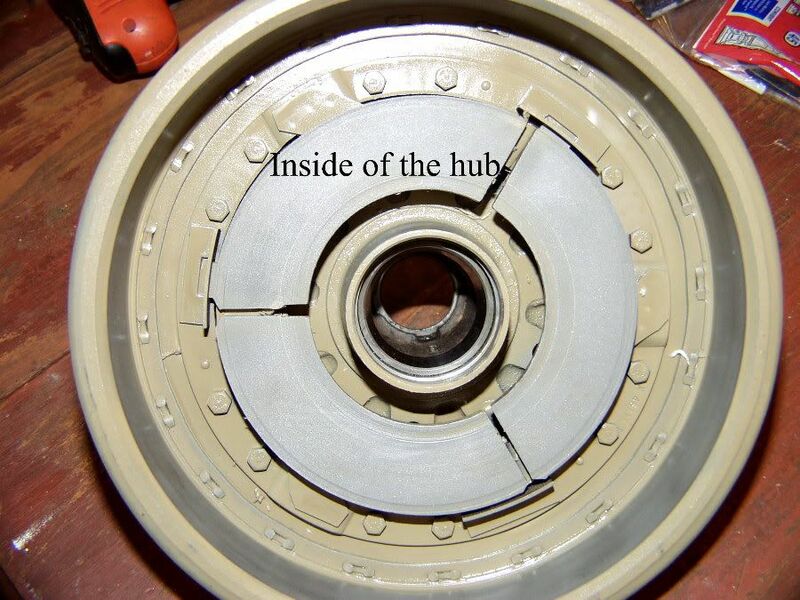 It is NOT a good idea to blast the interior of the hubs. You can quickly ruin the races, or if they have been removed, the surface that they are pressed into. Best to fill the cavity with towels, and if need be, tape the openings. Leave the towels/tape until you are done painting the hubs, then remove, blow out the cavity with compressed air (safety glasses!) and wash the insides with soapy water and a brush, rinse well. You don't want to leave ANY grit hiding inside where it will mix with the new grease...And proceed to destroy the bearings. After the hub has been removed, you'll be looking at the brakes (assuming you have a brake axle). 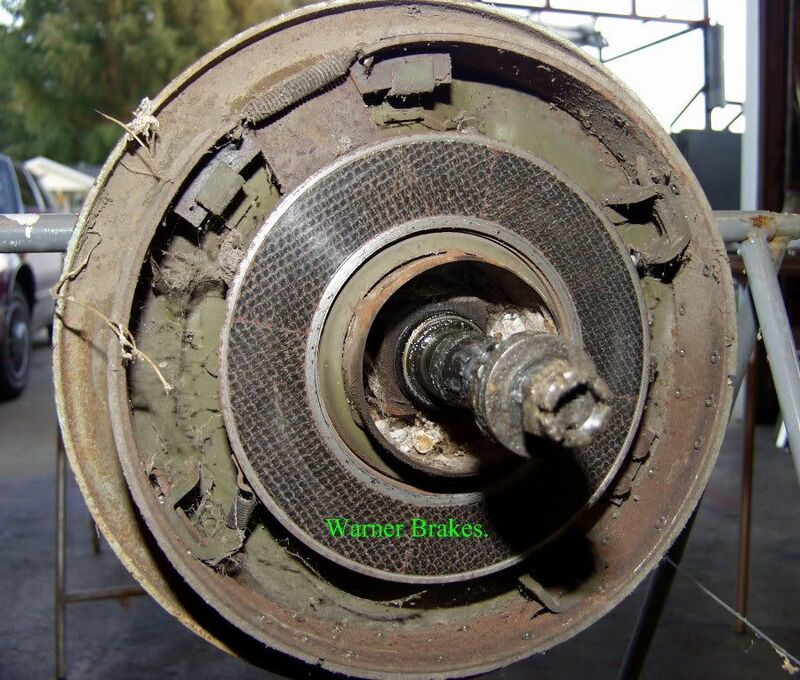 In this case, you are looking at a Warner brake system. Many people are mystified by this system, as it is different from a more modern brake setup, though it is actually far simpler than a new one. 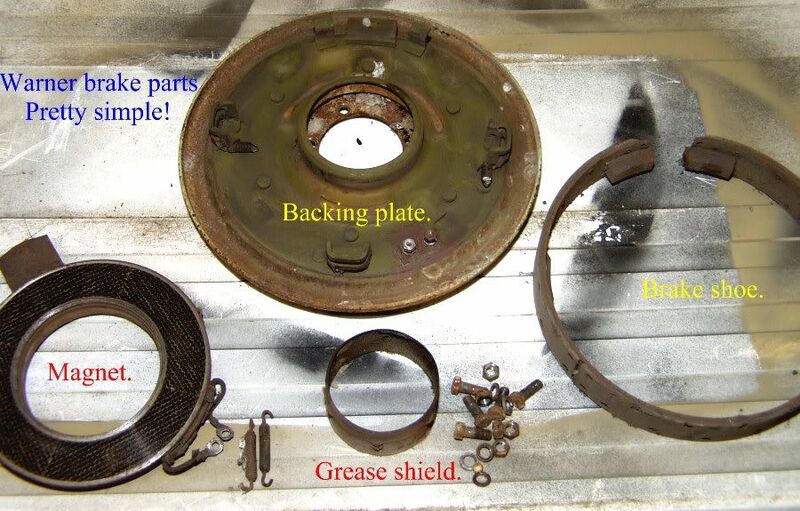 To disassemble, remove the two springs that connect the ends of the brake shoe. 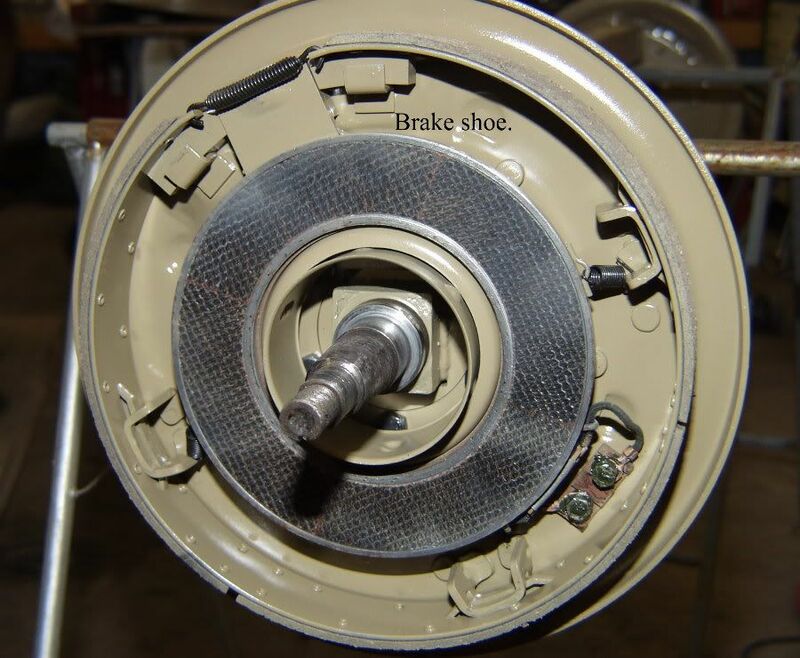 Grasp the ends of the brake shoe, and pull outward, then down. Now remove the two small springs that hold the magnet to the backing plate. The magnet can now be removed. 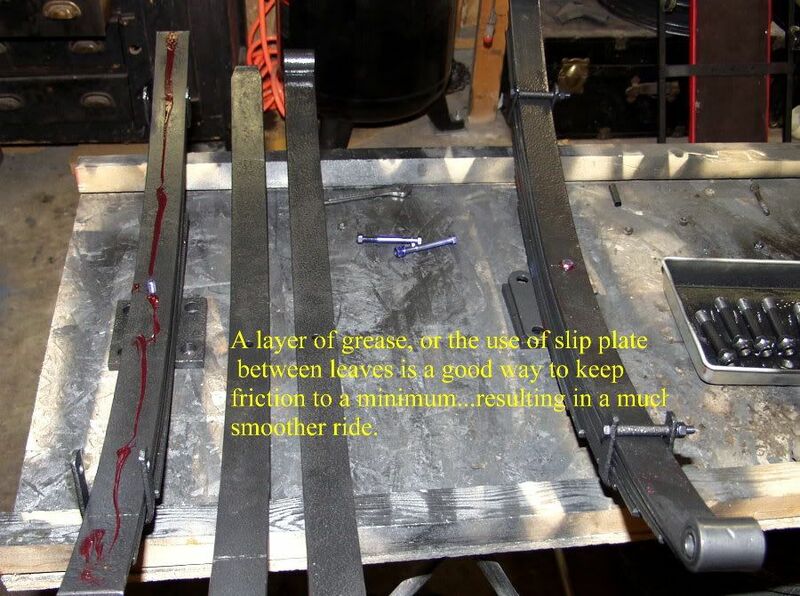 Now pull the grease shield off the center of the backing plate, it is a friction fit. In case you're wondering what the magnet is attracted to, the steel plate (actually three steel plates in this case) are mounted in the hub. The last step is to remove the backing plate from the axle. There are only 5 bolts. The nuts are on the outside of the backing plate, and the bolt heads are inside a recess in the plate, they'll probably turn. There is no room for a socket or regular wrench, but a distributor wrench will fit just fine (bent wrench). This is what's left after removing the backing plate. 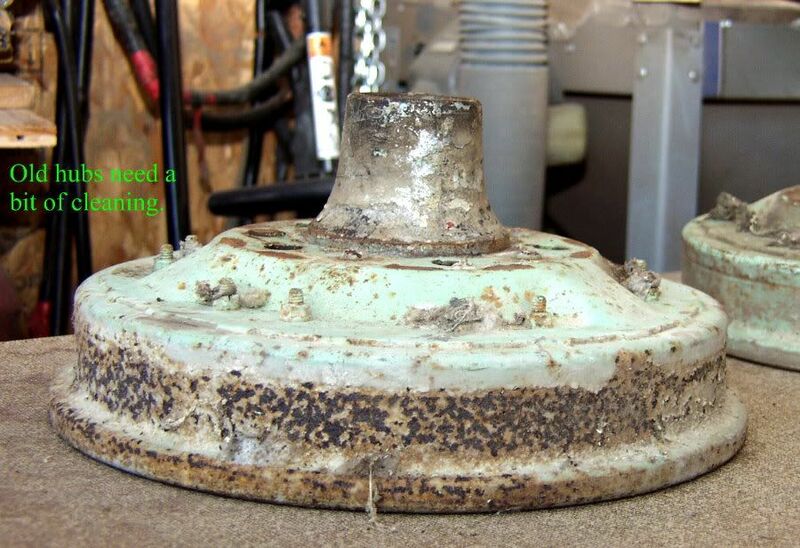 Once the backing plates are removed,the ends of the axle should be cleaned, and covered with something to protect them. Both the threads, and the machined surfaces the bearings ride on are now exposed, and prone to damage. 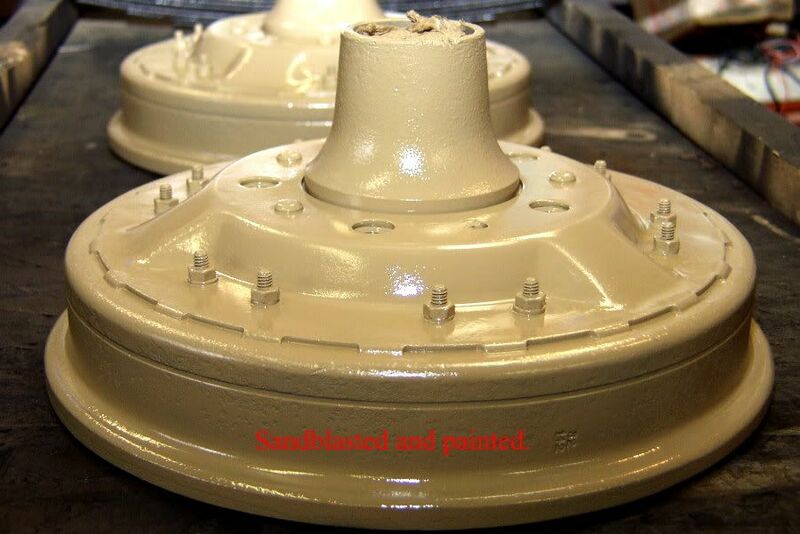 If you're sandblasting the axle, be sure to protect this area well. With all the parts sandblasted, checked, and painted, its time to put it all back together. First, I've bolted the backing plate to the hub, new lock washers (as always)were used. The only thing that needs to be removed from the backing plate for cleaning and painting, is the Bakelite electrical terminal pad (for the electric brakes) the pad was fine, but the stud, and nuts needed to have the tarnish removed. The magnet slides on to the backing plate, and is held in place by two small springs. The wire leads are attached to the terminals on the backing plate. Though not necessary, I prefer to use an antioxidant paste on all electrical connections. 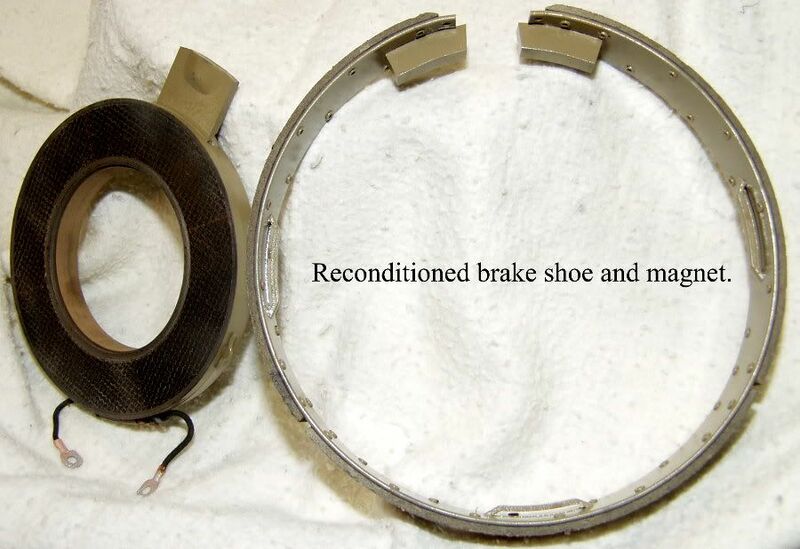 To install the brake shoe, grasp the two ends, pull slightly apart, and slip it over the notches in the backing plate. Install the two springs between the ends. Now install the grease shield and you're done. The reconditioned hubs sure look a lot better! I'm quite pleased to be at this point! All the components have been assembled, now I just have to slide it under the trailer, and lift it up to be bolted. This is a part of the job where a helper sure is handy. A floor jack (or two) helps, but having an extra hand will help it come together smoothly...without destroying the paint. 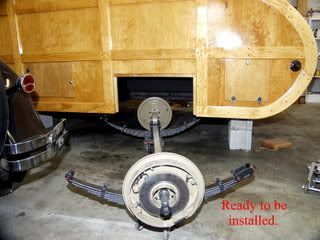 Once the axle is hung, I'll install new cotter pins, and grease the bolts. Oops, I didn't tell you about the bolts, did I? The bolts in question are the axle hanger bolts. The old style bolts had a hollow for grease, with a grease zerk at the end. The new style system relies on plastic (nylon) bushings...not so great in my opinion. If your bolts are badly worn from lack of greasing, have no fear, new greasable bolts can be had at trailer supply stores! If your bolts are badly worn, you'll want to press in new spring eye bushings too. Finally, the refurbished axle assembly is installed, just need to find some grease caps! It took something on the order of 20 hours and about a hundred dollars to complete. Well worth the peace of mind I'll have when cruising down the road at 70 mph, knowing there are no loose or broken parts! And as a bonus, it looks really good too! Please remember that this is not intended to be a step by step instruction manual, but rather a report on my experience refreshing an old axle. 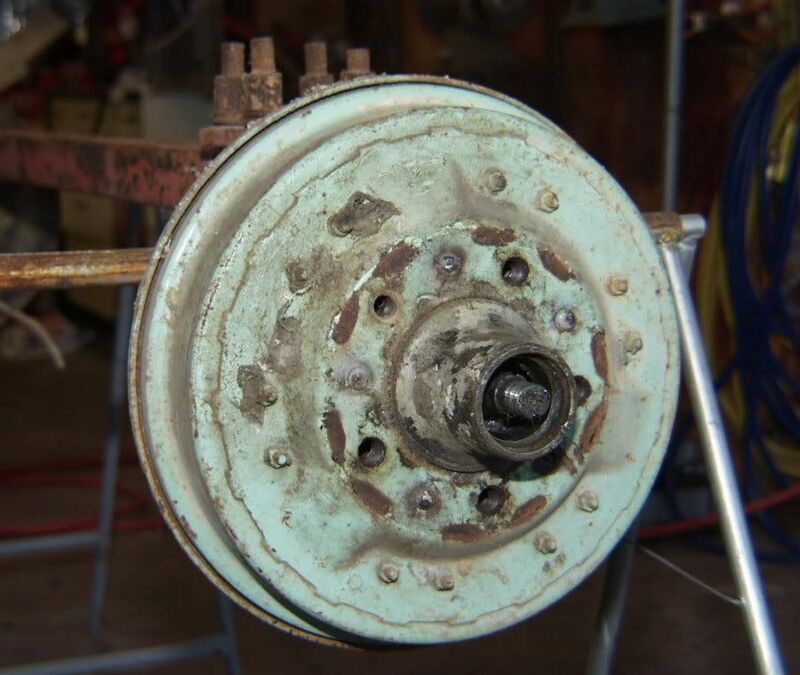 If nothing else a few more people have a better understanding of the "mysterious insides" of a brake system, and will be better equipped to tackle their own setup. 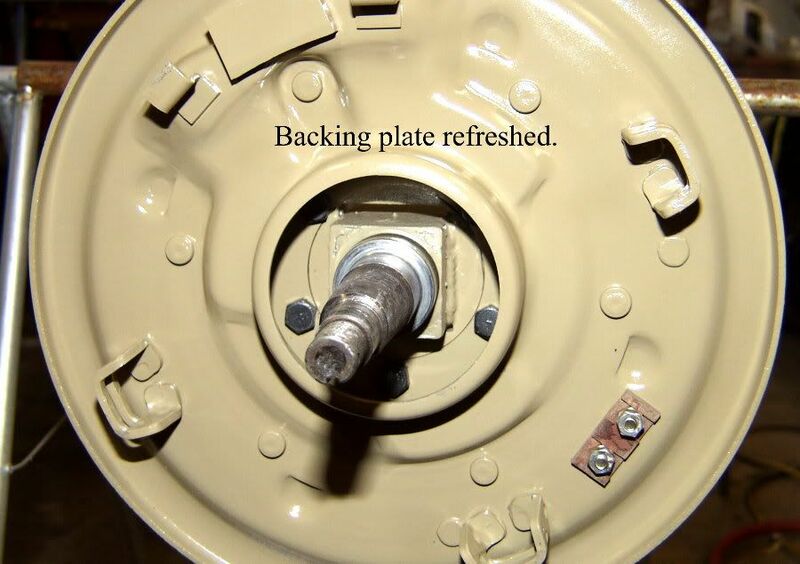 If you enjoyed this post, and like vintage trailers, please visit my "Repairing Yesterday's Trailers" page, where you'll find helpful advice, and be able to discuss repair issues with other old trailer fans. 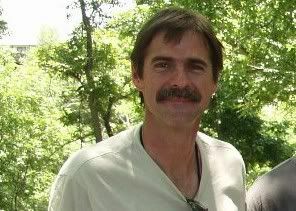 If you're really interested, and want more, Click here.